I grew up in Pakistan, obtained primary and secondary education in a town named Tando Adam in the southern part of Pakistan (Sind Province). I finished my higher secondary school from Government College, Lahore (presently Government College University) in 1981 and entered University of Engineering and Technology (UET), Lahore for Civil Engineering education. I graduated in January 1988 and soon after that joined UET as Lecturer. In January 1991 I got a scholarship by the Government of Denmark to study for Master degree at Asian Institute of Technology (AIT), Bangkok, Thailand. I completed my masters in Hydraulic and Coastal Engineering in August 1992 and returned back to Pakistan to serve at UET Lahore. I left UET in March 1993 to join AIT as a Research Associate with my master thesis advisor Prof. Hitoshi Tanaka from Tohoku university, Japan, who was a visiting faculty at AIT during that period. I went to Tohoku University, Japan for my Ph.D. under Prof. Tanaka's supervision in April 1994, graduated in February 1997 and went to Canada. 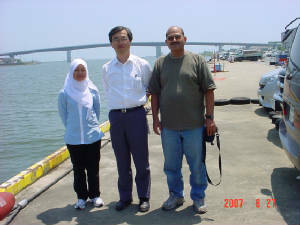 I went back to Japan as Research Associate of Prof. Tanaka in October 1998 and then to Canada again in October 1999. I worked at University of Northern British Columbia, Prince George for approximately six months as a Postdoc and Part-time Instructor. In Year 2000 I joined Nanyang Technological University, Singapore as Research Fellow. From there I came to Oman as a Lecturer in the Department of Civil Engineering (presently Department of Civil and Architectural Engineering) in January 2001. I am working here since then. For a detailed CV go to My Resume. Prime objective of my job is teaching, a profession of prophets. I love teaching and continuously try to improve my teaching style to make my students better understand the subjects I teach. In most of the subjects I teach, a substantial part is mathematics, especially calculus. I stress on physical meaning of the mathematical terms and equations. That way, we fully comprehend the processes described by the equations and the limitations of our knowledge. All the subjects related to water flow in natural and built environments.